Description: Well, at least it still has its GP30 carbody, but it looks like its classified as a GP39M. Northtown got a lot of cool power sitting around the diesel shops these days. Description: A better view of this ex CB&Q GP30 then I got of it a few months ago. 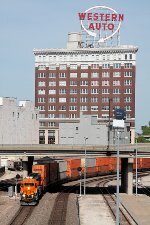 Its sorta a CB&Q homecoming at 44th, the switcher behind the 2830 is ex CB&Q, and one unit away is an ex CB&Q SD9. 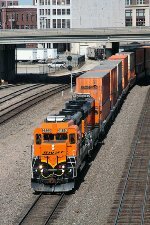 Description: When's the last time you saw a pair of GP30 carbodies on a stack train? 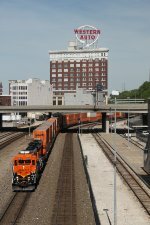 Well, for a while now this pair has been handling the KCS Flyer from BNSF Argentine Yard to KCS Knoche Yard and back. I have to admit, Heritage-III looks pretty snappy on these. 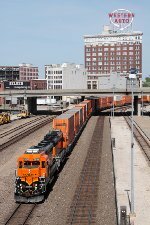 Description: The KCS Flyer comes into BNSF Argentine Yard from KCS Knoche Yard.